Electrosonic Ltd is a worldwide audio-visual company with extensive experience in designing, project managing, engineering and supporting AV systems and products. "Rescue from Dunkirk, Casemate Z, where state of the art special effects have been used to dramatically present the events of 26 May to 4 June 1940. Twenty-three Optoma EX785 projectors create giant images that run the entire length of the space augmented by spectacular lighting effects. German fighter planes appear to zoom down the entire length of the tunnel immersing visitors in the action on the Dunkirk beaches." Peter Barrett, Leisure Solutions Director, Entertainment, Electrosonic Ltd. Challenge: To update the visitor experience as part of a guided tour through the Napoleonic tunnels at Dover Castle, focusing on their use during World War II. The main challenge was using a high degree of visual and audio interpretation without impacting on or detracting from the historical space. Solution: Twenty-three Optoma EX785 projectors were installed in the main Dunkirk to Dover tunnel and three in other areas. Optoma was approached to supply the projectors for this project because they fitted specific demands for particular resolution short throw off axis projection whilst remaining in budget and offering a warranty for continuous operation. Results: Visitors to the Napoleonic tunnels at Dover Castle have been provided with an eye-catching experience that offers a long synchronized AV experience for visitors to really become part of the attraction. 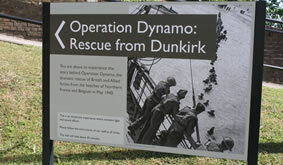 On 10 June 2011, English Heritage opened the doors to their new attraction “Operation Dynamo: Rescue from Dunkirk”. The network of Secret Wartime Tunnels stretches 60m in length, twenty-six metres deep underground, behind the White Cliffs of Dover. Audiovisual technology is used throughout the eight zones to re-create the drama of the Dunkirk evacuation.The designer and producer of the new experience was Kvorning Design and Communication of Denmark. Electrosonic was the AV systems integrator on this project, working with Kvorning from the initial design stage, to help validate design ideas, until completion. A visit to the new Dover Secret Wartime Tunnel’s experience involves groups of up to 30 people being taken through eight zones containing original news-reels and recordings, two years of painstaking research, testimonies from veterans of both the beaches and the tunnels, and state-of-the-art special effects to deliver a vivid account of what Sir Winston Churchill called a “miracle of deliverance”. The main challenge faced by the designer was how to include a high degree of visual and audio interpretation without impacting on or detracting from the historical space. Rob Ferguson from Electrosonic was responsible for the initial design of this project, this included carrying out projection tests on site to ensure the project was feasible. The project executed by Rob Stallard, Senior Project Manager and Ed Osborn, Senior Engineer of Electrosonic.Many of the original tunnel features had to remain and be preserved. 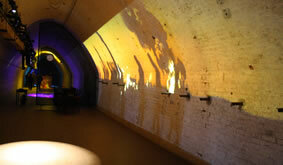 A great deal of new technology had to be installed without destroying any of the historical features of the tunnels and keep it aesthetically pleasing to visitors.Projecting onto a curved tunnel wall was another challenge which was overcome using twenty-three Optoma projectors edge-blended and with sides warped and straightened by a Dataton Watchout™ system. Staff working in the tunnel had to adapt quickly to the wet, dark, deep tunnels. "Rescue from Dunkirk, Casemate Z, where state of the art special effects have been used to dramatically present the events of 26 May to 4 June 1940. Twenty-three Optoma EX785 projectors create giant images that run the entire length of the space augmented by spectacular lighting effects. German ἀghter planes appear to zoom down the entire length of the tunnel immersing visitors in the action on the Dunkirk beaches." Peter Barrett, Leisure Solutions Director, Entertainment, Electrosonic Ltd.
Optoma Solution: Why and how? The Dover Castle project was started on 24th December 2010. Being an English Heritage Site the end client had a budget they needed to adhere to. “Optoma was approached to supply the projectors for this project because they fitted specific demands for particular resolution short throw off axis projection whilst remaining in budget and offering a warranty for continuous operation.” Peter Barrett, Leisure Solutions Director, Entertainment, Electrosonic Ltd. In total Twenty-six Optoma EX785 projectors with short throw lens were used (twenty-three in the main Dunkirk to Dover tunnel, three in other areas). 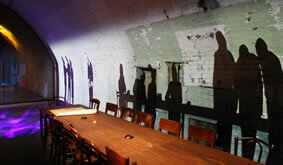 The Optoma projectors made it possible to create a long synchronised audio visual experience for visitors to really become part of the attraction. 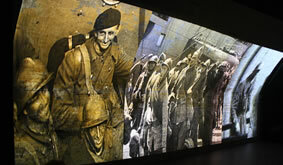 In an exceptionally strong field including pan-European and direct manufacturer entries, the Dover Castle installation by Electrosonic Ltd “Operation Dynamo: Rescue from Dunkirk” was awarded ‘Highy Commended’ for ‘Consumer Installation of the Year’. Equipment list: Twenty-six Optoma EX785 projectors with short throw lens from the ProScene range.